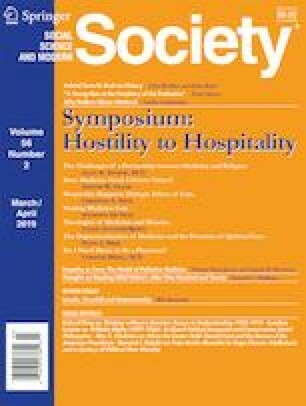 In Hostility to Hospitality, Michael and Tracy Balboni, call for greater attention to the underlying spiritual commitments that motivate clinical practice. They argue that secular medicine constitutes an unacknowledged “functional” religion, a “religion of immanence” or one that denies any source of meaning outside the material and further that traditional religious outlooks provide a better explanation for why care of the sick is such a crucial human value. Patients often rely upon religion for spiritual support and clinicians need better training in how to engage with patients about spiritual concerns. The Balbonis are on solid ground in proposing greater attention to professionalism and sense of vocation in medical and nursing education, with the inclusion of religious and philosophical perspectives. Some of their other proposals seem less well thought through, though worthy of continued discussion and debate. Some may see their suggestion that medical and nursing professionals provide spiritual care as overly intrusive. An alternative view might understand attentive, high quality medical care as in itself a form of spiritual care, which religion helps sustain through its reminder that medicine is both craft and calling.